It doesn't matter what type of RV you own; at some point, you'll experience a maintenance or repair issue that could seriously dig into your travel savings. Since RVs are all about being able to travel around inexpensively, it's better to use this RV owner's manual to learn how to fix the problem yourself. It's an affordable and simple solution for making sure you're staying on budget. And more importantly, it can get you out of a jam if an issue pops up while you're out on the road. Having this camper and travel trailer owner's manual on hand could save you lots of money and wasted time. When it comes to RV manuals, this specific guide by Clymer is one of the best. It's a valuable resource that covers just about everything you need to know, from lubrication, maintenance and tune-ups to exhaustive details about safety, supplies, towing, winterization and more. Best of all, it's a comprehensive resource that covers virtually all types of RVs, including motor homes, trailers and campers. V-Belts may be the item most overlooked during maintenance, but proper care and maintenance of V-belts and their sheaves (pulleys) can yield great rewards. The nature of V-belts makes preventive maintenance relatively easy. Unlike fatigue or flaws in direct drives that are very often invisible until an abrupt failure, V-belts and sheaves wear gradually and usually give advance warning of failure. Nonetheless, it is important to recognize the warnings. Before attempting any maintenance, be sure the controlling switch is in the OFF position and lock it in OFF if possible. Other safety procedures - such as blocking - may be required to assure safety. All belts and sheaves will wear as part of their life's cycle. As wear occurs, the belts will ride lower in the grooves; because the sheave center distance must be increased to compensate, a worn belt is, in effect, longer than a new one. V-belts grip by wedging in the pulley grooves. Belts that are too loose cause slippage, loss of power, loss of speed and rapid wear to both the belt and the sheave. A howl or squeal indicates that the belt is too loose or the load is too heavy. A properly loaded vehicle will perform better and handle more safely. Store heavier items on or close to the floor and as centrally as possible. Lighter items may be stored in cabinets, closets and drawers. Luggage or similar cargo transported inside your RV should be secured to prevent it from causing damage in case of a sudden stop. Weight limits recorded on the Federal Certification Sticker or the Vehicle Identification Number plate are maximum limits and exceeding these weights must be considered unsafe. Accurate axle weights are also necessary when determining correct tire inflation pressure. It is therefore extremely important to weigh the vehicle before leaving on a trip. This RV manual features valuable information on warranties, safety, waste drainage systems, winterization and storage, care and maintenance, LP-gas systems, LP-gas appliances and hundreds of other topics necessary for operating a recreational vehicle. Also included is a special reference chart for quick and easy inspection of the vehicle's present condition. 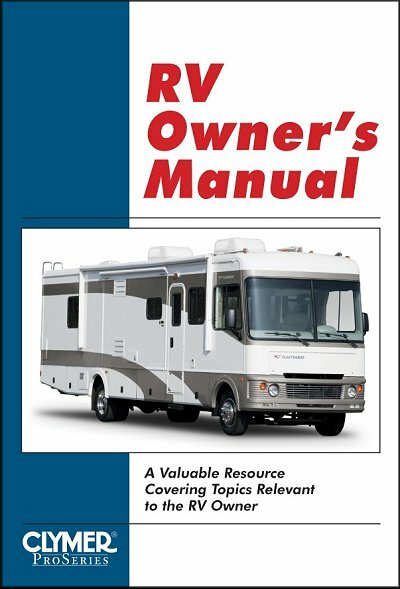 Ask a question about RV Owner's Manual. This is just what I have been searching for was a fair price fast shipping. I would buy again from Motor Book Store, You should also.